As regular readers of this blog (or followers on my Facebook Page) know, my friend Carol has been coming over for a ‘catch-up’ for a number of years now. Although we live only a few minutes walk away from each other, it’s the only time we see each other. We have only a few unspoken but very important rules for our meetings. I am in charge of the food and I am a lucky friend as Carol eats anything (that’s why she is one of my favourite friends). Not once over the years (and we are talking 16 + years by now) has she disliked anything I prepared for her. As we do talk a lot, the food needs to be easy to handle, be tasty but not interfere with our chatting. 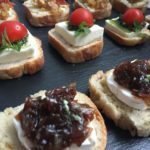 Fingerfood and Canapés have appeared in different disguises and I thought it is time to share the recipes with you lovely people. 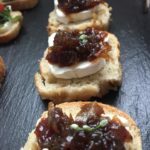 A Row of Canapés is a great way of trying different flavour combination but it is also quick and easy to prepare and most of the time even inexpensive (not that Carol isn’t worth the effort and money). Below are some ideas (tried and tested by Canapé expert Carol) and I hope you try them out. I will share more recipes in the following days – so look our for part 2. First, caramelise the walnuts by adding the walnuts, butter and sugar in a pan over a medium heat. Start stirring to avoid burning of the walnuts. It will look absolutely disgusting at the start and you are forgiven to think that it will never work. Be patient, after a while the walnuts will turn a beautiful golden brown colour. When the sugar has dissolved and the depth of colour you like has been achieved (be careful tho, a second too long and it will turn from a beautiful caramel to a black coal-like piece), place a sheet of parchment paper on a baking tray and scatter the walnuts over it. Separate the nuts so that they don’t touch each other and leave to cool. The sugar coating will harden while cooling (make more because you will love them so much that you can’t resist nibbling away on them. 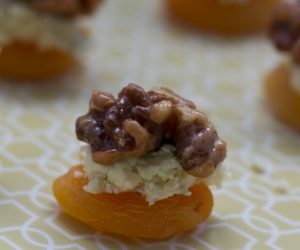 Before serving, take the apricots, spoon a little of the blue cheese on top (if you have a creamy blue cheese, you can whisk it up and using a piping bag with a star nozzle, pipe the cheese onto the apricots. 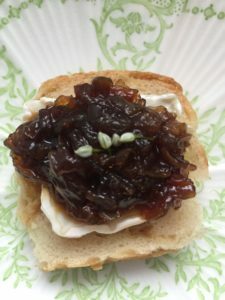 I love the Highbank Orchard Syrup and I would drizzle a few drops of it onto the blue cheese before topping the apricot with a walnut halve – but this is a matter of taste and I always happen to have a bottle in the cupboard. Don’t worry if you don’t have it – the bites are just as tasty without it. Arrange on a platter or tray and serve. You can make these bites about an hour before your guests arrive. Makes 20 bites. Please try this – it is utterly delicious. The deep sweetness of the grapes with the light sourness of a fresh goats cheese is simply beautiful. Pre-heat the oven to 160C. Cut the baguette in 20-25 equal slices (don’t cut them in an angle but straight). Drizzle with a bit of olive oil and bake in the oven until crisp and slightly starting to brown around the edges. Transfer on a wired rack to cool. Set aside until needed (this can be done a day ahead but store the slices in an airtight container to keep them dry). Remove the stalks from the grapes and place in a bowl. Add t 2 tbsp of olive oil and the balsamic as well as the thyme (no need to remove the leaves, we want the flavour and will remove the sprigs), mix well to coat all grapes. Season with sea salt. In the pre-heated oven, turn the heat down to 140C and scatter the grapes onto a baking tray. Slow roast for about 30 minutes or until the skin is starting to shrink. remove from the oven and leave to cool. 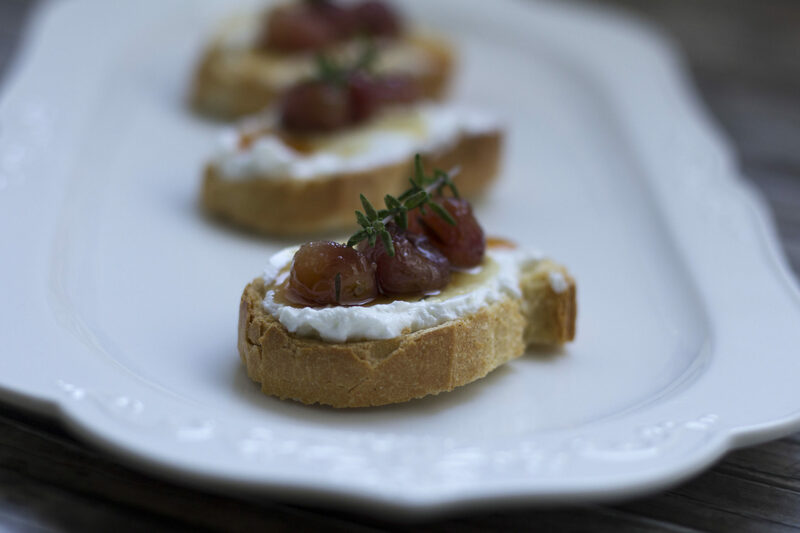 Before serving, spread or pipe the goats cheese onto the slices of toasted baguette and divide the grapes between them, arranging them nicely on each slice. Sprinkle some of the fresh thyme leaves over, arrange on a platter or tray and serve. I wouldn’t arrange them too early as the baguette slices can go soggy after a while. Makes 20-25 slices. This is a version of my caramelised onion tart with goats cheese (I get hanged if I don’t serve it at a party) but here I am using the combination on a mini toast (note: I made the toast slices myself but Melba Toast works just as fine and is widely available. You can also simply cut normal toast (sliced pan) into squares and toast them). In a frying pan, heat the olive oil over a medium heat and add the onion slices. The secret to good caramelised onions is time. You can’t rush it (or you buy a jar of onion jam). Sauté until the onions are soft but still translucent. Now add the balsamic and sugar and continue to sauté until the sugar has dissolved and the vinegar starts to evaporate, keep stirring to avoid the sugar burning into the pan. It will take about 20 – 30 minutes, please take the time as the result is so worth the effort (and much better than any shop-bought version). Set aside to cool. Arrange the toast slices on a tray or platter, slice the goats cheese in as many slices as you have toasts and arrange a slice of cheese on each toast. Spoon the cooled onion mix on top and decorate with a chive flower (if you have). The toasts can be arranged about an hour before your guests arrive. Makes 20 toasts. Ok, hands up – I buy ready-pesto most of the time. Iago in Cork has an amazing pesto but to be honest, I also used the Aldi version (the semi-fresh one in the chilled section – not the jarred one) and have to admit that it is lovey. The problem with supermarket versions, the pinenuts have been replaced by the cheaper cashew nuts but the Aldi version also includes basil. 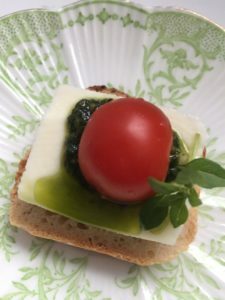 I do make my own when I come across good fresh basil (it is the one herb I can’t seem to be able to grow at home). But the costs of pinenuts will make the homemade version more expensive. This must be the easiest canapé ever – it is basically just an assembly of nice things. Again, I made my own toast but as above, you can choose any option suitable to you. I love the West Cork Mozzarella made in Macroom by the amazing Sean Ferry on Johnny Lynch’s Buffalo Farm. The texture is amazing and you can’t get fresher produce than that. West Cork Mozzarella is also available in Aldi (but get in early as it sells out like mad). Drain the mozzarella and slice in 20 equal slices (my toast was square, so I cut the slices into squares as well – for the cut-offs, simply drizzle some good olive oil over it and sprinkle with sea salt and nibble away on them while you prepare the rest). Arrange the slices on the toasts, top with a dollop of pesto and finally place a half cherry tomato on each. From the bunch of fresh basil, take some of the smaller leaves and decorate your toasts with.